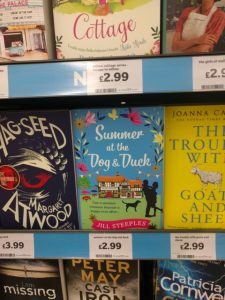 Today is paperback publication day for Summer at The Dog & Duck which is now gracing the shelves of Sainsbury’s and keeping very good company in the photo below! Remember, if you see the book out in the wild then please do post a ‘shelfie’ on Twitter or FB, I’d love to see any photos! There’ll be a dog and duck goody bag to one person, picked randomly, who posts a pic. 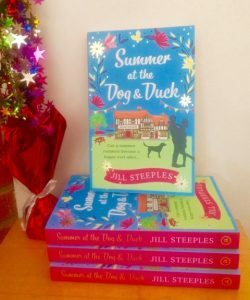 Recently, and totally unexpectedly, I received a very exciting email from my editor telling me that the paperback version of Summer at The Dog & Duck will be going into Sainsbury’s stores as from 10th August. This is the first of my books to go into a retail shop, so you can imagine how thrilled I am by this exciting development. The e-book has received some lovely reviews and feedback from readers and I’m delighted that it will now be available on the book shelves of my new favourite supermarket! Today my copies arrived in the post and they look totally gorgeous with the pretty summery colours and gold foil highlighting. What do you think? If that wasn’t exciting enough, I’ve just heard that Winter at The Dog & Duck will also be going into Sainsbury’s from 21st September! 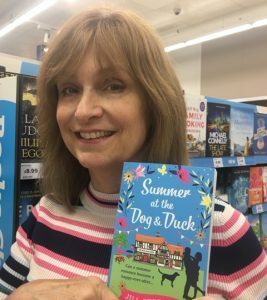 If you happen to see Summer at The Dog & Duck on the shelves of your local supermarket, please do post a ‘shelfie’ on Twitter of FB, I’d love to see any photos! I’ll be giving away a dog and duck goody bag to one person, picked randomly, who posts a pic.